There was a different kind of premiere at the Festival d’Avignon last weekend. 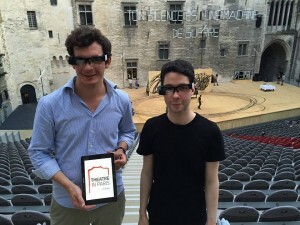 The audience at Olivier Py’s French-language staging of King Lear were able to watch the show through a pair of augmented reality glasses, which displayed a translated text in real time. There’s a choice of French, English or Mandarin; the projected text is visible only to the wearer. According to de Poncins, the final product could be in use in opera houses and theatres in the UK within a year. Dramatic reductions in neck pain from craning to view surtitles is one expected outcome. Viewers who already wear prescription glasses, however, may grumble about having to double up. The Heidelberg University is currently developing comparable glasses which not only provide subtitles, but also subtleties, to be able to follow the implications of the plot of Wagner’s Ring with explications, provisionally thought to be possible in four languages. Researchers are also trying to find a way of changing the time experience of the performance, so that at every moment the viewer/listener can sink into the labyrinth of associations and references and Leitmotivs without loosing the thread.